Today we went to San Pedro to a sugar cane village, Laurita and spent several hours playing with the kids. There were at least 100 children. David, Luke, Mason, Nate, Jake, and Jonathan did the skit of the Good Samaritan. David gave his testimony. There were a lot of Christians in this village and our visit was one of encouragement. We split up and went to to two different fields. 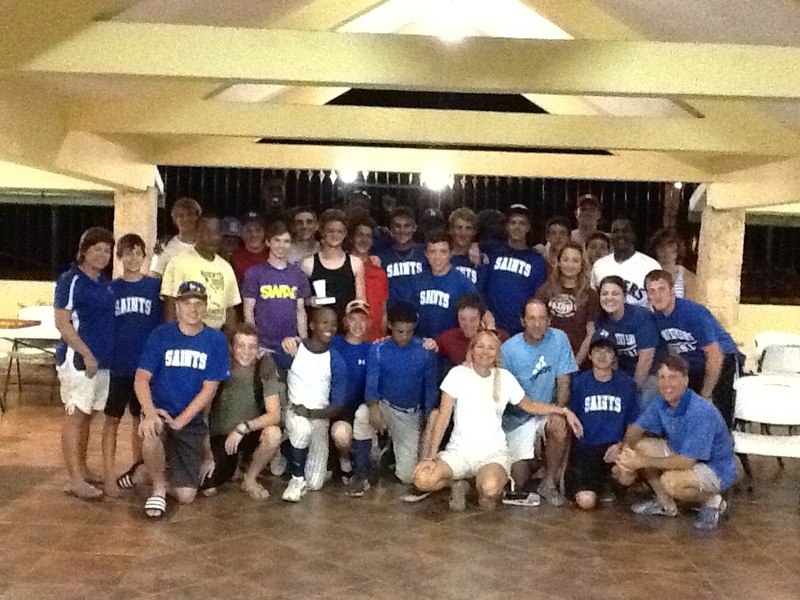 Chris and Joe took Ryan, Grant, Mitch, Luke, Zac, 6 Dominican players, and translator Eric, to Al Completion de San Pedro field. The team won 12-2. Chris shared the gospel. David, Shellie, Molly, and Kimberly took David S, Jake, David R., Michael, Russell, Mason, Niels, Asa, Ethan, Gabe, and Jonathan S, along with translator Filipa to Julie Fields . The team tied 12-12, although, we should have won... They had an interesting rule...when one of their batters got a walk, they sent a runner out and allowed the batter to continue, we just let that one go. There were people walking in the outfield and kids flying kites. The bases were cardboard, so it made for an interesting game. Jon, Chelsea, and Mike Shaheen traveled to both games. Michael shared his testimony. Shellie - Saw Jesus in Asa who carried a handicap boy a long distance when we were at the sugar cane field. Jake - Didn't know where we were going this afternoon, he had been wanting to go to a certain village, but today, our bus pulled up at the place he had wanted to go. He kept looking for Edgar and couldn't find him. Michael and Jake changed positions, and Jake was in the outfield...It was about the 4th inning and the Edgar came a jumped on his back. He was so excited to see him again. We arrived back to Score just in time for dinner. Miguel and Luis shared his testimony and we were joined by the Dominican players and Mike for our Bible study this evening, Attributes of Christianity. It was really cool as it was translated and back and forth, Spanish and English. Everyone was a part of the discussion and it was a great picture that the gospel transcends language and culture.